So I got the blooming nine patch I made for my cousin's wedding back from the quilter recently. Here are a few pics. I absolutely LOVE it! There's a little piece of me that wants to keep it for myself, but I won't. It's totally my cousin and his soon-to-be-wife. You can see the pantograph here in this last picture. 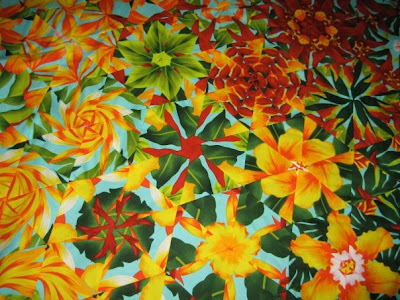 The flowers look a lot like one of the flowers in one of the fabrics, so it goes nice. It was quilted using a light tan color. 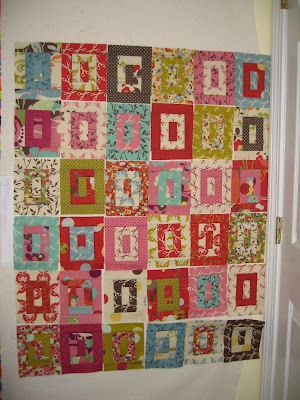 If you remember a while back, I blogged about my autumn quilt. This was a REALLY big quilt, bigger than a queen but not quite a king. Too big for me to quilt on my machine. So I sent it off to a local quilter to have an all over leaf pantograph quilted on it. 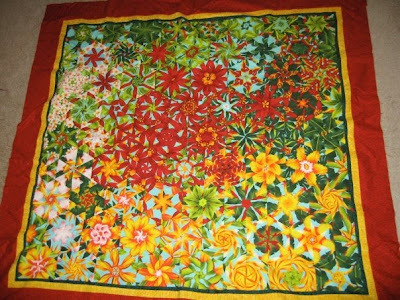 Well, I got it back right before Christmas, but just found time (and convinced my DH to help) to photograph the quilt. It's not the whole quilt, but you get the idea. Once the snow melts I hope to get a picture of the whole thing. 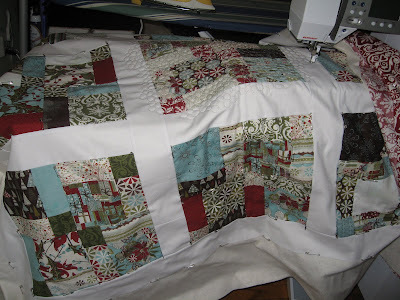 Here's a picture that shows some of the quilting. It's quilted with a gold thread. Now to bind this massive quilt. I already have the binding prepared, I just need to attach it to the front and hand quilt it down to the back. I have a feeling that the binding on this quilt won't be done for a little while. We'll see. I finished putting the binding on the bento box last week. It's now 100% complete! My first official finish of 2010. Here's a close-up of the quilting. It's a variegated lime, blue, and purple thread from Superior Thread King Tut's collection. 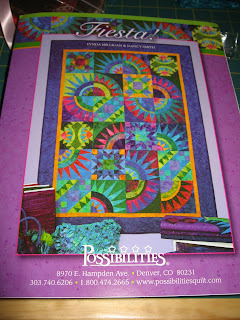 I'm taking a class beginning in March at a LQS with KK and Lynn. I'm really looking forward to it. 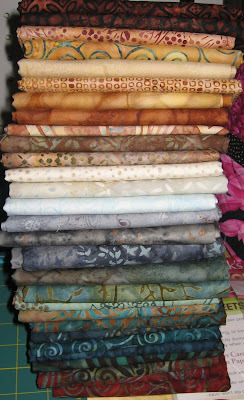 It doesn't start for a month, but I already have a lot of the fabric I want to use. They're all batiks. I'm going for the browns, rusts, and teals. I'm just hoping I have enough contrast since the pattern really calls for a lot of contrast. I have a few brighter teals, but I'm not sure they fit with the color scheme. I'll have to bring them with me to see as I go along. 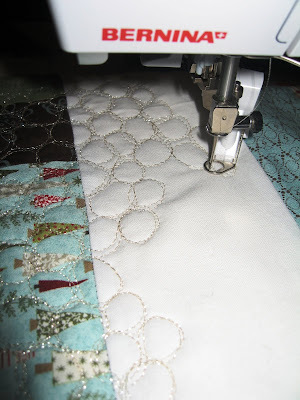 It's not like I've never done paper piecing (as you've been able to tell in this blog) or curved piecing. It's more to gather for the social experience and learn a few tips. 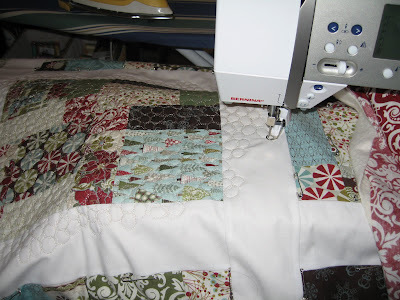 I always seem to learn something even though I've been quilting for a good 7 years now. I don't think that will ever change either. I'm looking forward to this class because I really like the pattern. Here's another layout of the honey bun quilt I mentioned last post. I've moved a few things around, but I'm not sure I'm completely happy with it, so it will stay on the design wall for a little while longer. I'm also working on quilting the Figgy Pudding quilt I mentioned in the last post that I realized I haven't show pictures of. I should have taken a picture when I had it all flat when I was basting it, but I spaced on that. I'm doing an all over pebble quilting on it. I'm using a silver metalic thread. I was a little apprehensive to use it given my experience with that kind of thread in the past, but I've been liking the quality of Superior Threads over the past few years, so I thought I'd give theirs a try. I'm actually impressed with how the thread is quilting. I've gone through one bobbin so far and haven't had any breakage (knock on wood). I switched to a 90/14 Needle like recommended on the thread packaging. In my Bernina manual, it recommended going down to a 2 tension on the top thread while the packaging on the thread said to go down to a 1. I did some test quilting, and I found the number 2 tension to be better. And a closer look at the quilting.